This article came out 3 weeks ago and it’s a goodie that talks about the world-class whitewater feature that will be built for the upcoming 2013 World Freestyle Kayaking Championships. Who said elite kayakers aren’t geeky in their own right? Find out about the feature set on this wave-shaper! Here is the full story by one of our favorite local newspapers, The Smoky Mountain News. These guys did a really nice job talking about the wave-shaper contraption, what it means to our Bryson City NC home in the Smokies, and why it turns the Nantahala Gorge into an incredible world–class athletic venue for freestyle whitewater kayaking. It is pretty exciting, and YOU can come watch the action here riverside in 2012 and 2013. Now that’s cool. On Saturday, July 2nd, the Nantahala Wave was the site of the third event in the Hometown Throwdown series. This event series gives paddlers a chance to experience competing in a casual and fun freestyle event. There was a great turnout for the event which started late in the day to finish up in the evening with the Nantahala Wave lit up for the paddlers. 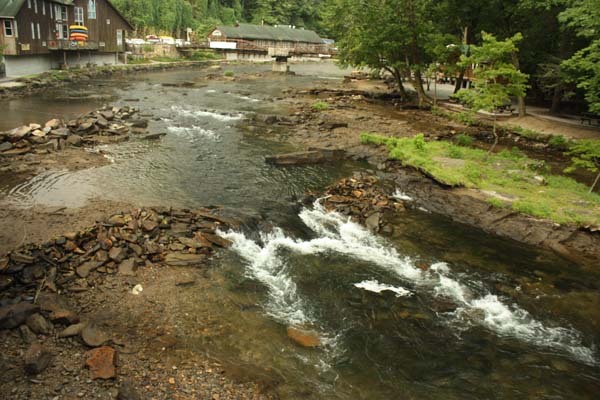 An official proposal from the Nantahala Outdoor Center to the US Army Corps of Engineers has been submitted for impact and development of the Nantahala River site for the 2013 World Freestyle Kayaking Championships. This proposal to create a whitewater training and event site includes construction and maintenance of existing rock jetties, an adjustable wave structure, a weir, a pool, temporary flashboards, temporary viewing stands, and a temporary judging platform. One major concern with the proposed project is the impact to the Nantahala riverbed and creating a site that fits in with the natural river ecology. With the permitting process, the Army Corps is soliciting public opinion on the possible impacts of the proposed development and will include submissions into a decision process for the final outcome of the project. Comments gathered will also be used to determine the need for a public hearing. This proposal will have a significant impact on the local paddling and rafting communities in Swain County, it is important to make a submission of opinion to the Army Corps. Information on where to submit written comments is in the proposal, page 5. Download the proposal to the Army Corps of Engineers here. Wednesday evening, May 18th, paddlers and rafting outfitters had an opportunity to meet with John Anderson of the McLaughlin Whitewater Group and Lee Leibfarth of the Nantahala Outdoor Center to learn about the proposed development of the Nantahala River for the 2013 World Freestyle Kayaking Championships. For years, local paddlers have maintained by hand “wing dams” that channel the river’s currents into a surfing wave. The main objective of river development project for the 2013 Worlds is to stabilize the river bed for a permanent feature, provide better “eddys” or pools with slow water for rafting and paddler take-outs, and prepare the site for temporary spectator view and judging platforms. The McLaughlin Whitewater Group has years of experience developing whitewater parks across the United States, including the nearby Upper Ocoee Olympic Whitewater section in Tenessee. Some of the unique technologies that the McLaughlin Group has pioneered is an adjustable wave shaper that can form different wave features for events or just general surfing. The proposed project for the Nantahala includes possibly installing a “wave shaper” device in the river bed to create the wave feature for the 2013 Worlds competition. John was very interested with the input from the local paddlers on what the ideal wave “feature” would be and how it would fit in to the natural riverbed of the Nantahala. Welcome to our new blog and Things To Do In The Smokies event website.We know this area intimately, from years and years of living here and doing all the things we now offer you info about on this site. The Bryson City – Cherokee NC side of the Great Smoky Mountains National Park is the outdoor recreation capital of the Smokies. It is easy to see why! White water rafting, kayaking, lake touring, fishing, hiking, jetboat rides, Harrah’s Cherokee Casino for concerts, arts and crafts festivals and performing arts centers, and much much more are within minutes of our gateway town. Start planning your Smoky Mountain getaway now with Yellow Rose Realty and take advantage of our inside track on things to do, upcoming events, and the best rental cabin deals here in the NC Smokies. Visit our main website Yellow Rose Realty, to book cabin rentals and adventure packages, or find your dream real estate in the Smokies.